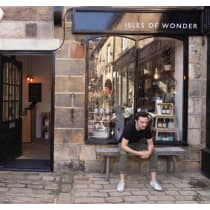 Located in the charming Yorkshire town of Harrogate, Isles of Wonder offers a range of homewares, books, gifts and beauty accessories. Owner Stewart spent years working in garment manufacturing across Asia and Europe, and upon his return to the UK was stricken by the entrepreneurial spirit of British craft and how different it felt from factory floors. As such, Isles of Wonder reflects the pride and philosophy of British design throughout, with uniquely British brands hand-selected to showcase pieces that combine quality and authenticity with contemporary design. "When I opened my boutique I vowed to carefully curate top quality goods from independent British artisans and put them in a unique retail environment that customers would enjoy."